Fund managers are increasingly viewing Russia as the most attractive emerging economy, according a February survey by Merrill Lynch. Confidence in Russia has actually increased since the onset of global pessimism in early autumn. Risk aversion among fund managers is at its highest level in more than seven years, says "The Global Fund Manager Survey", a monthly report canvassing the views of more than 300 institutional, retail, and hedge fund managers worldwide. Doubts over the economy and corporate profitability have contributed to a notable rise in the levels of portfolio cash, up to an average 4.7pc from 3.9pc in January. 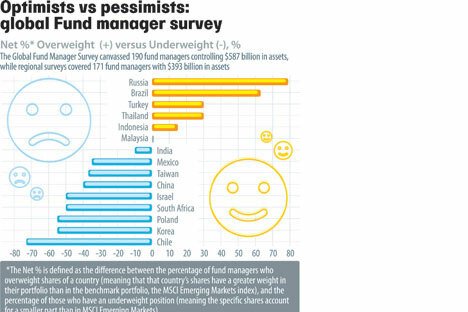 Forty-one pc of fund managers are currently overweight in cash, the highest percentage since the 9/11 terrorist attacks. David Bowers, independent consultant to the survey, said risk aversion was now so widespread he wondered if anything could inspire fund managers to put cash back into the stock market. It's remarkable, then, how much confidence international fund managers are showing in the Russian market. As of February, optimism in the leading Slavic market outnumbered pessimism by 73pc. This compares with 46pc in November 2007, 79pc in December 2007, and 57pc in January 2008. Brazil is second with 64pc, while the remaining BRIC countries - India and China - posted modest results. As many as 59pc of fund managers said Russia was the best investment destination within BRIC (32pc in November 2007). Twenty-three pc favour Brazil (55pc), and 9pc China and India (14pc and 0pc respectively in November 2007). Only 5pc of fund managers said Russia was the least preferable investment destination. These rough measures are borne out by more specific investment tracking figures. According to EPFR Global, a fund tracking emerging portfolio fund research, Russia was in fact the only BRIC market that received new money in the period February 4-11, the week Merrill Lynch was conducting its survey. What is more, Russian share funds registered a net inflow of capital during 21 weeks of the past 22. EPFR reports that $496.4m has been invested in Russian share funds since early January to February 8, while BRIC funds have otherwise lost $544.6m. Why, then, is the headline RTS Russian stock index is not growing in accordingly? One of the reasons, according to Alfa-Bank's strategic expert Erik DePoy, is that the funds usually do not open their positions immediately, and instead wait for an opportune moment to play the market. Mid-February, when the leading RTS index posted gains of 7.14pc over three days, looked one such possibility, he said, but more likely was that the moment would come only after the presidential elections.